"Who and what is next?" Cities and state legislatures have been scrambling	to	define their laws in respect to gay marriage. Cities from Portland and Corvallis Oregon, and San Francisco, California to New Palz, New York have been performing gay marriages. To read a Chronology of anti-gay legislation and events,	click	here. 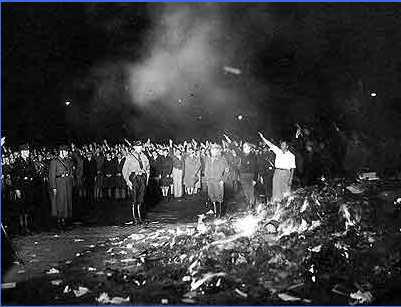 The photo below shows the burning of homosexual books in Berlin. At least one ADF project, the Blackstone Fellowship for law students, has ties to the Christian Reconstructionist movement. Christian Reconstructionists advocate a society anchored in "biblical law" and would literally base U.S. law on the legal code of the Old Testament. Statements about homosexuals is not new for the Religious Right. Gay-marriage licenses are "death certificates"
"Amendment 2 is a ballot initiative that seeks to amend the Colorado Constitution. 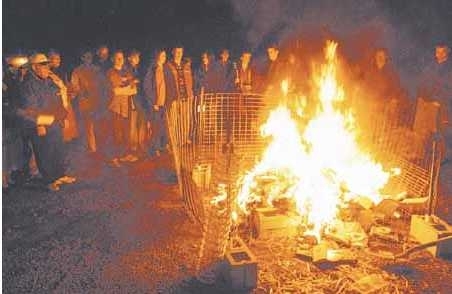 The amendment was passed by a majority of Colorado voters in November 1992, and was to take effect on January 15, 1993." Jean Hardisty, founder and Director of Political Research Associates, explains the history of homophobia in the Religious Right. Gays, thanks to the ballot measures passed on Tuesday, cannot get married in 11 new states. Thank God. Just think of all those wedding gifts we won't have to buy now.